Prepare the Basic Shortbread Crust per instructions and bake at 350 on the bottom rack for 15 minutes. Let cool. In a medium bowl, mix the sweetener, cornstarch (arrowroot) and salt together with a hand mixer. Add the eggs and yolks and mix thoroughly. Add the lemon juice and mix until the powdered sweetener is dissolved. 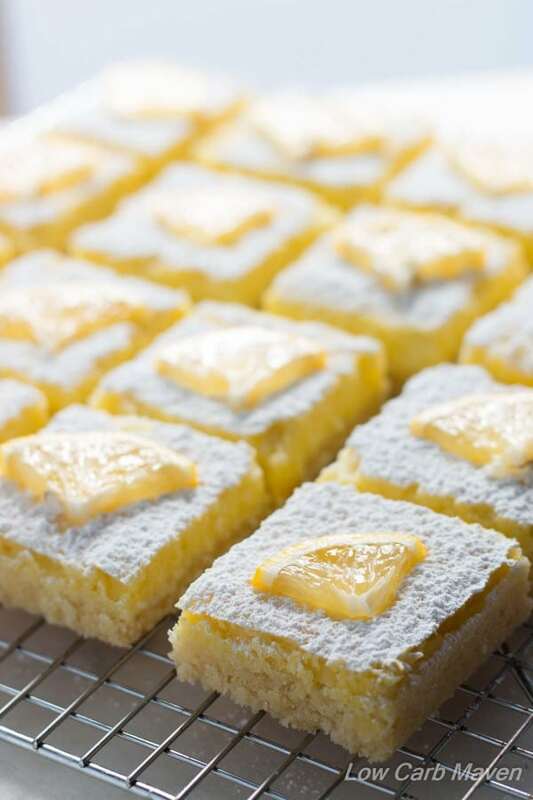 Pour the lemon mixture onto the cooled shortbread crust and bake for approximately 30 minutes or until the lemon custard is just cooked through. I use a 9x9 square pan, an 8x8 pan will produce thicker bars and may affect cooking time. NOTE: Spray a 9x9 inch metal pan with baking spray and line with a piece of parchment that covers all or most of the bottom of the pan and overhangs two opposite sides. This will help you remove the whole dessert from the pan. Follow the directions of your recipe as this may be pre-baked before proceeding with the recipe -OR- it may be used as is in the recipe with no pre-baking. My recipes are generally baked at 350 degrees. Measure all of the dry ingredients into a smallish mixing bowl. Mix thoroughly with a whisk. Melt the butter and add it to the dry ingredients. Stir and press the mixture with a large spoon or rubber spatula until the butter is incorporated. Squeeze a small amount in your hand to test if it will hold together nicely. If not, add 1-2 more tablespoons of melted butter. Press firmly into a prepared pan. Follow the directions of your recipe for baking. I bake on the bottom rack or the position of from that to get a browned bottom. Variations: Sub 1/3 cup of cocoa powder for the vanilla whey protein powder. Sub an equal amount of Sukrin Gold (powder after measuring) for the erythritol.